Looking at a map, the islands of Harris and Lewis seem to be one isle only. As far as the landscape and history is concerned they are truly two different islands. These two islands are linked by the northern Harris hills. To the north, Lewis is a flat land, very wet and its landscape consist of moorlands and lots of lochens. Lewis is the most populated and Stornoway, the capital of the outer Hebrides is on Lewis. To the south, northern Harris is a chain of mountains which goes as high as almost 2600 ft, with the outer Hebrides' highest summits which can be spotted from mainland and the isle of Skye. The south of Harris is separated from its northern part by an isthmus where Tarbert is located, Harris main settelment. Southern Harris' landscape is impressively lunar and the west coast have many beautiful white sand beaches. The link between these two countries is the influence of religion on the way of life of their inhabitants. The church of Scotland is presbyterian, the minister and the elders lead their community (the movie Breaking the Waves show these communities a few years ago). Sunday is really the Lord's day, no ferries, no shops open. Life is all but held back on the isles on sundays. However this rule seems to be waning since there is now a gas station open on sundays out of Stornoway going south. After a saturday spent on Harris back in 1995, we came back a full week-end in 2003 on Harris and Lewis. These two trips were most impressive and wonderful experiences, a lot of feelings and breathtaking landscapes on Harris and the discovery of Lewis. During our first trip to Skye, the images of the white sand beaches of Harris made us plan a car less trip to Harris. Saturday is the only day when one can go explore Harris and came back the same day. We booked a bed and breakfast for two nights at Uig. The landlady is very kind and tea time is around 9 pm. We declined the tour on Lewis on coach from Tarbert because our goal was to spend the more time as possible on the beaches. When we arrive at Tarbert we let go the wave of tourists who get on board the coaches to Lewis, and then we discover that we just missed the bus which goes south along the beaches. Fortunately another bus is leaving in a few hours. Tarbert is a small settlement and a lot of attractions are closed on saturday, including the bank we cannot get any money. We quickly went around Tarbert, there are only few shops and our wait seems longer as time goes by. Luckily the wait is worth it. The bus drove across the lunar hills of Harris and then stopped in the middle of nowhere at Seilebost. There are a few houses, a school and behind a few dunes, we reached the white sand of the beach. When we reach it the tide is low and the experience is unforgetable. A lot of sand and pure water everywhere around, some other people walking by. We went back to Tarbert with the bus. There is no bus stop. We waited along the road where the bus left us and hope that it will came back. After this day far from the tourists highway and spent at the rythm of the isle we came backto Skye with a lot of images and having a good experience of how difficult the life on the island is. After such an experience we had no choice but to come back in 2003. For this trip we planned a full sunday on the isle experience. Departure saturday morning, coming back monday, the fullsunday spent on the isles. 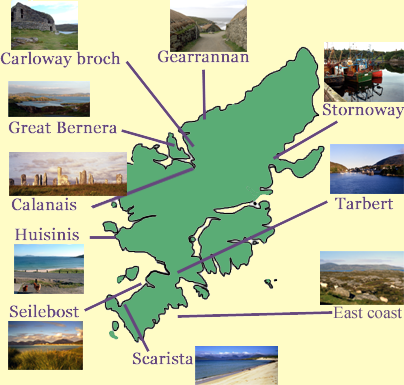 Our accomodation is at Stornoway hence we can explore both Harris and Lewis. On the road to Stornoway (Steornabhagh), we had to stop because a funeral was taking place and the people use the main road for a few hundred meters to go to the cemetery. There are only men, the rule forbiding women to go to the cemetery was still in use. There you go about the presbyterian atmosphere. When we reach our bed and breakfast we have a good surprise, breakfast is served on sunday. Going through our guides we discover that every tourists attraction stick to the sunday closure rule. We have to hurry visiting these sites. We began by the traditionnal settlement of Gearrannan, next to the sea. Our second stop is for the broch of Carloway (Càrlabhagh), a stone tower,one of the best preserved broch of the Hebrides. We cannot explore Lewis without seeing Calanais. At first it seemed a trap for tourists. Calanais is on all the guides, our fear is a queue of coaches. We could avoid the tourists and enjoy this quiet site by coming after 7 pm, every coach were back to the ferry and the site is left alone. To end our tour we went by chance on Great Bernera (Beàrnaraigh). The land on the isle and around is a real mix of land and water with all the lochens. It is difficult just by looking around, which is which between Great Bernera and the isle of Lewis around. We went through the island toward the beach at the other side. The beach of Bostadh is not very large but is very quiet, isolated and wild. There is no hesitation, Bostadh has a good rank in the top 10 of the most beautiful beaches of Scotland. Sunday, we planned to discover the coasts of Harris.We went south following the eastern coast. This part of Harris is mineral, rocky, lunar and cut out. Along this road we could enjoy beautiful views across the minch to Skye and mainland. During a stop we had the chance to see a bunch of wild geese on the side of a loch. The western coast is a succession of long sandy beaches, each of them is awesome and bathed by the warmness of the Gulf Stream. The first beach is Scarista. Before going on Scarista we looked at it from behind at Taobh Tuàth. All along the coast there are several little beaches until the huge beach of Seilebost, and the dunes of Losgaintir on the background. At last, at the foot of the mountains of northern Harris, is located the small beach of Huisinis. The beach and its hens are a reward for driving on the single track road leading there. Click on the location you want to discover and bon voyage! We enjoyed the welcome and comfortable bed of B&B Kerry Croy of Mrs Hill at Stornoway.